Featuring half-time entertainment by house polka band, the Bratwurst Brothers. Pre-show featuring The St. Paul Bouncing Team. We'll be giving away a special limited edition Minnesota RollerGirls t-shirt to the first 200 people in the doors. There will also be a very limited quantity for sale for $15 and when they're gone, they're gone. So get there early! ... And new this season: get your name - or your favorite skater's name - custom printed on the back of any Minnesota RollerGirls t-shirt. On site, done by the time you go home. Join us at O'Garas after the bout to hobnob with your favorite rollergirls, try your hand at karaoke, and enjoy PBR drink specials. It might not be something that all of you folks know, but sokay has her own blog specializing in fake meat products. As such, for the last couple months, she had been planning to do a fake turkey Thanksgiving meal. Obviously, all the usual suspects will be there - stuffing, yams, mashed potatoes & vegetarian gravy, cranberries, green beans, etc. What we haven't decided on, however, was what fake meat product to choose from. Tofurky was the obvious choice to review, of course, but I figured that since I know so many vegetarians, that it couldn't hurt to ask for other recommendations if people like other fake turkey products better. I guess there's no reason why we couldn't do a head-to-head competition, if the products aren't too expensive. As anybody who has known me for any length of time knows, there is one food that towers above all my other favorite foods. It's not ice cream, not strawberries, nor even fresh asparagus: it is a little-known Japanese food that goes by the name of takoyaki. Takoyaki, Japanese for "fried octopus", it is a round octopus dumpling served at vendor stands all across Japan, particularly in the Kansai region. Unfortunately, takoyaki is a downright rarity in the States - particularly so here in Minnesota, where we don't have a large Japanese population. To me, this is a crying shame – the Japanese themselves eat way more donburi, udon, ramen, soba, omuraisu, tonkatsu, takoyaki, onigiri, etc., etc. than they eat sushi, and yet all we get here in Minnesota is more or less a big heaping pile of mediocre sushi places. Hope is not completely lost - after all, Midori's Floating World Cafe sells takoyaki; it's not bad, but it's not quite the Ōsaka-style takoyaki that I pine for. Octopus - how does it manage to simultaneously be so intimidating and yet so delicious? Drop the whole octopus arm into boiling water. Boil for no longer than three minutes. Note to local restaurants: YES, THAT'S THREE MINUTES. THREE. NOT TEN, NOT FIFTEEN. THREE. 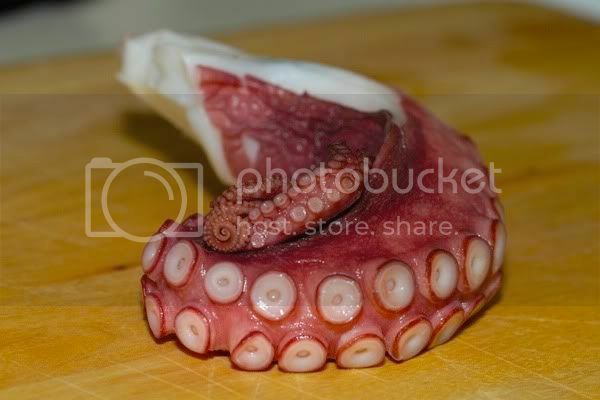 Octopus is almost always improperly cooked. If you've ever had tasteless, chewy octopus - and if you've ordered octopus off a menu, then you probably have - that's because it has most likely been overcooked. Properly cooked octopus should be soft and have a buttery flavor. Anyways, after the octopus has boiled for about three minutes (three! ), remove it from the water and chop it into bite-size bits. In mixing bowl, combine cake flour, dashi-flavored ice-water, egg, soy sauce, salt, and sakura ebi. Mix lightly, until flour clumps are mostly gone, being careful not to overmix. Heat your cast-iron takoyaki pan over medium-high heat. If you don't have a takoyaki pan - and most people don't - you can do what I do and use a well-seasoned traditional Danish æbleskiver pan. Coat both the top of the pan and the holes with oil. I use rice bran oil, because it has both a high smoke point and a neutral flavor, but regular canola oil works well in a pinch. Pour the batter into each of the holes, filling them almost to the brim. Then, drop a piece of octopus into each hole, and sprinkle in the green onions. Æbleskiver pan, takoyaki pan, what's the difference? 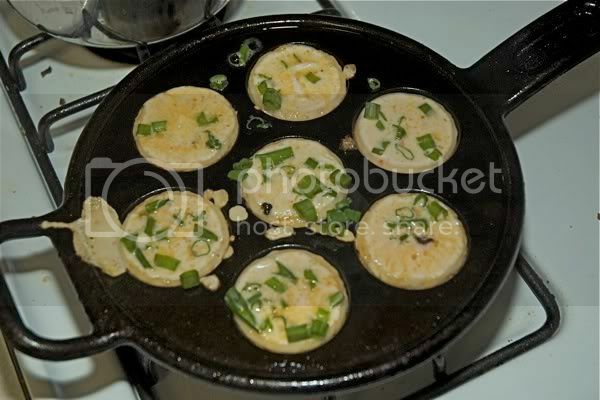 Wait until the pan-facing side of the takoyaki has cooked, and then rotate them up to a 90° angle. After they've been rotated, quickly rotate them so that the open end is facing downward. This youtube video does a decent job of showing the proper technique. 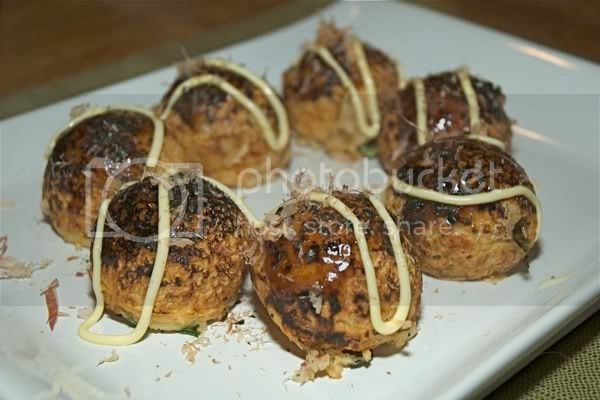 After they've finished cooking, remove the takoyaki using your chopsticks and place them on a plate. Brush the top of the takoyaki with a generous helping of okonomiyaki sauce. I use Otafuku-brand Okonomi sauce; it is widely available and has no hydrolyzed pork protein. Then, sprinkle on your ground aonori flakes. Squirt on some Japanese-style mayonnaise, and then finish it off with the dried bonito flakes. Consume while hot and gooey! It's Japanese fast food, but oh-so-delicious! High point of weekend: french toast made from homemade pumpkin bread, lathered in Grade B maple syrup, and accompanied by some Morningstar (fake) sausage patties. Featuring half-time entertainment by Strut & Shock, and a pre-show at 7pm featuring Kuk Sool Wan. We'll be giving away a special limited edition Minnesota RollerGirls t-shirt to the first 200 people in the doors. There will also be a very limited quantity for sale for $15 and when they're gone, they're gone. So get there early! ... And new for this season: get your name - or your favorite skater's name - custom printed on the back of any Minnesota RollerGirls t-shirt. On site, done by the time you go home. Join us at Station 4 after the bout to hobnob with your favorite rollergirls, try your hand at karaoke, and enjoy PBR drink specials. So, I was reading some whining about whether or not Inge's jersey was brushed by Keppel's pitch in the 12th, and then decided to do some digging into the history of this sort of thing (ahh, Wikipedia). "Don't dig in against Bob Gibson, he'll knock you down. He'd knock down his own grandmother if she dared to challenge him. Don't stare at him, don't smile at him, don't talk to him. He doesn't like it. If you happen to hit a home run, don't run too slow, don't run too fast. If you happen to want to celebrate, get in the tunnel first. And if he hits you, don't charge the mound, because he's a Gold Glove boxer.' I'm like, 'Damn, what about my 17-game hitting streak?' That was the night it ended." Anyways, that cracked me up. Also, so did this. Ah, Bo Jackson. In my dream last night, I was a member of a crime fighting duo with, that's right, Barack Obama. He let me try out his spy equipment to track down a thief, and once let me drive around one of his supercars (a Masarati) with him - although I had a hard time figuring out all the widgets and knobs with such short notice. At one point in the dream, while we were out catching a bad guy, Barack stopped to give away the keys to his Masarati to a homeless guy. The guy politely refused, lecturing us that, without a change to the underlying economic and social systems in the United States, the money he would gain from the sale of the car would be insufficient to pull him out of poverty for any significant amount of time. I wish I could have slept forever... stupid mornings! For some reason that I don't comprehend, every three months or so, my body tells me to eat nothing but oatmeal for workday lunches for a couple weeks. Now, it is my understanding that sometimes your body will make you crave certain foods because of some sort of nutritional deficit in your diet - but why oatmeal? It's just a grain! Is my body trying to tell me that it's craving more soluble fiber? Or is trying to hint to me that, perhaps, my cholesterol is too high? Go ahead - google "recursion". I know you want to! Only one of these can be seen from space. Which is it? Depending on what you consider "space", the answer is either neither of them or both of them, plus a whole hell of a lot more. Gah! Deep Discount DVD is having their semi-annual 25% off sale. Their prices are usually lower than Amazon's to begin with, so it's a good time to stock up on the movies you've been pining for. 25% codes include HOTSTUFF, DVDTALK, and FACEBOOK25. Only applies for movies (DVD, Blu-Ray, etc. ), not video games. Enjoy! I was out for my morning walk - where interesting things always seem to happen - and, lo!, something interesting did happen. I was at about 36th Street & 38th Avenue, and this super cute kitty walks up to me and starts purring. I start petting it and it rolls over onto its back, writhing in pleasure. Sits up, I pet, rolls over, repeat and repeat. And making cute sounds! I was powerless. She doesn't have a collar, but she's declawed, so I figure that she's somebody's housecat that got loose - or was abandoned. :( I go up to the house she was in front of, and knock, but nobody answers. At this point, I decide to bring this cat home and call Animal Control, but I'm about 10 blocks from my house. As I encourage the cat while it follows me, the next door neighbors come out of the house. I ask them if they recognize the cat, but they have never seen it before. :( They point at all their neighbors houses and list off what pets the various houses have. Boo! I then ask them if they'd be willing to give me and the cat a ride to my house, and they agree! Go Minneapolisans! So, I pile into the car, carrying the very docile cat, and ride home. I carry the cat into the house, bring it into the basement, and get it some food. Things seem to be going okay thus far. She's loves to jump - tried to jump up on an 8' window sill and fell down (it's a slanted sill). A bit moewy, and caused a ruckus with my cats until I stuffed a blanket in front of the door so that they couldn't see each other. Also distracted my cats with an opening of the front porch, despite having the A/C on. Animal Control said they'd be by in 2-3 days, although I'll probably bring the cat in sometime this afternoon instead. Unless anybody wants to adopt! 10:45am Update: She's now calmed down and is sleeping on the big beanbag in the basement. I went down to pet her, and she did some headbutting, belly rolling, and body rubbing. Happy kitty, although definitely scared by the sounds that our cats make upstairs. 1:45pm Update: I've seen the cat eat some food, drink some water, and paw in the litterbox some. That's encouraging! She also constantly talks while you pet her - making some of the weirdest chirping sounds I've ever heard from a cat. 4:00pm Update: Taking cute kitty (temporarily named Cuddlemonster) to the vet to see if she's chipped or not. Car rides with kitties are always an adventure! 4:30pm Update: Not chipped! Looks like she'll be with us a little while longer. The last week or so have been so crazy busy, that I've found myself shaking from exhaustion at times. Last weekend was no different, and, despite the fatigue, I'm pretty happy with how things turned out. After that, we reinstalled the camshaft bolts, which have their own unique order and torque specs. Then, we flipped the engine over and repeated the same process over again... and the new heads were installed. Whew! Took about six hours worth of work between the two of us to get them installed. Sunday was also busy - it was another week of soldering my fire flower. The last week had left me really dizzy, so we set up better ventilation this time - which helped a bit, although I was still very headachey afterwards. It probably didn't help that I was experimenting with lead-free solder, which is a huge PITA compared to the leaded stuff. But, after many hours of soldering (and some repairs), everything was almost completely finished. I still need to put a black patina on it, so the solder will turn black. And that's it! Time for another project, which will most likely be a napkin holder for our table. Wee, more lead-free solder... Thanks again to lacewindu for her awesome help on this project. She rocks! Did you know that Hayao Miyazaki's son Goro released a movie a few years back titled Tales From Earthsea? It's not exactly getting rave reviews (6.6 on IMDb), and Le Guin kind of thought it was "meh" (probably because it deviated from her books so much), but I'll probably see it when the Sci-Fi network's copyright exclusivity crumbum expires in 2010. I do love me some Earthsea - no book did more to get me into reading than A Wizard of Earthsea. It changed my life! Also, a second Did You Know? Apparently, the Earthsea series was a huge influence on Hayao Miyazaki's works, and he keeps a copy of them at his bedside. I was reading a thread about a dystopian future wherein robotic lawnmowers rule the earth and somebody brought up the famous Ray Bradbury short story called There Will Come Soft Rains. Although I haven't read it, it reminded me of one of my favorite short stories, coincidentally by the same author. All Summer in a Day is a story that about a girl living on Venus who is constantly bullied due to her having grown up on Earth. I'd love to describe the story more, but I don't want to spoil for people. That said, this story had a huge impact on me when I was a kid because I identified with the girl so much. In fact, of all the books and stories I read before the age of ten, this is the only story I really remember. If that doesn't work, go to this website and search for "all summer in a day" - it should pop up a Word doc you can read. Looks like I'm going to be helping an ex-teacher of mine rebuild the engine in his Subaru Outback this week. Got a full eight-hour session of getting greasy all booked up. Very excited - this is definitely the most involved automobile repair that I've helped with to date. sokay: And you know what swims in the sand? Principalities! Uh huh... busted! It very rarely remember my dreams, let alone at 2pm, so I figured it must be something significant. The dream left me even more flummoxed because I could have spelled the word A1X8I1A1L1 with the letters in my hand, and AXIAL is at least an authentic, real word. After looking at both my new and old x-rays, the surgeon declared that the original break was considerably worse than what the original doctor had told me. And, while he's not certain exactly why I'm still having pain at 16 weeks, he is fairly certain that there's not much they can do about it surgically or otherwise. He then further inspired confidence by declaring that I may have some pain and arthritis in that finger for the rest of my life. Goodie! On the plus side, the freaky break does look like it is healing well as far as bone restructuring goes, and he did say that it should continue to at least get better than it currently is... it may just take a few more months. They also recommended that I continue buddy-taping my finger whenever I'm doing any heavy lifting or sporting or whatever. I think my favorite part of the whole appointment was, after I declared that the biggest problem with the pinky pain is how difficult it is to type with nine fingers, the PA asked why I couldn't just buddy-tape my pinky and ring-finger together - to which I responded with the only thing I could think of: "..."
In a mere two hours, I will be heading out to see a finger surgeon about my twice-fractured left pinky that has been causing me considerable pain over the last four months. I've finally gotten to the point where I can type very lightly with it and have about 75% flexibility, but any significant pressure on the tip or any sideways blows to my finger are still fairly agonizing. I'm really hoping that they'll tell me that it will continue to heal on its own over the next year or so, because I really, really don't want to have to deal with any more surgery. That said, it would be pretty damned nice to be able to return to ten-fingered typing. In what may possibly be the best headline you'll read this year, a judge has ruled that a Reasonable Consumer Would Know "Crunchberries" Are Not Real. According to the complaint, Sugawara and other consumers were misled not only by the use of the word "berries" in the name, but also by the front of the box, which features the product's namesake, Cap'n Crunch, aggressively "thrusting a spoonful of 'Crunchberries' at the prospective buyer." I think my very favorite thing to do with my cats is to cozy on up and use them as a pillow while they are sleeping on my bed. Especially when, ear to belly, I can listen to them purring because they are so very happy. Internets! Please help settle another long-lived debate that sokay and I are having. On an amusing sidenote, I was out for my run yesterday, when I looked down at some sidewalk chalk drawings that some children had made. So, I was out for my morning walk&read today when I heard a loud crackling from this huge 80' oak tree next to me. I figured it was just some squirrels being squirrels when all of a sudden I hear a *thwomp* a few feet away from me. I look over, and I see this über-cute baby raccoon that had just fallen to the ground. It couldn't have been longer than 6" from head to tail tip, but it had the usual raccoon stripes and was *totally* adorable. I was worried that it was hurt - not that there was anything I could do about - because for the first couple minutes of me watching it, it did nothing but shake violently. After a couple minutes, it started making these baby chittering sounds (also cute). I continued to sit there watching it - telling passersby to be quiet - and after a couple more minutes, I see this gigantic, shaggy, clumsy momma raccoon climbing down from the tree. After it was about 10' from the ground, she stopped and stared at me for a while from a nearby branch, but eventually decided that I wasn't a threat. Then, she climbs down onto the ground, grabs her baby in her mouth, and then starts climbing back up the tree. It looked quite difficult for such a bulky creature - quite a bit of bark was raining down as she climbed - but she nevertheless made it back up the tree. So, next time that you're walking around town, try to be aware of the fact that a 20lb raccoon could drop out of the sky and land on your head... at any time! 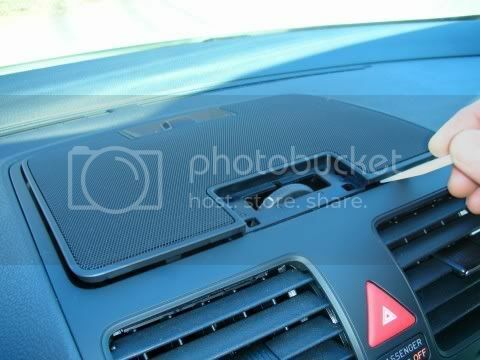 So, I went into Burnsville VW a couple weeks ago to have them fix the center console air diffuser rattle in my car. Sadly, after around for a bit, I realized that the TSB fix they had done made absolutely no difference. Given my completely rational hatred of rattles, I decided to take things into my own hands and fix it myself. 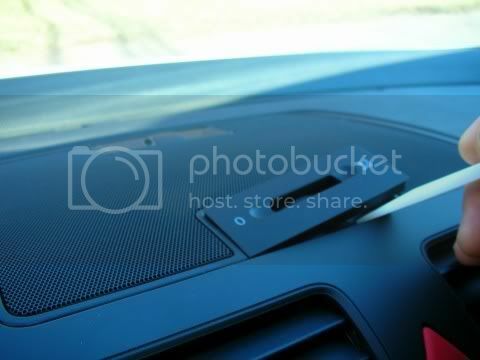 These images were taken from vwvortex; I just added some stuff - most notably, those aren't my hairy arms in the photos... just in case you were wondering. Took my cheapo HF plastic trim tools and peeled up this piece in the front and the plastic bit in the back. 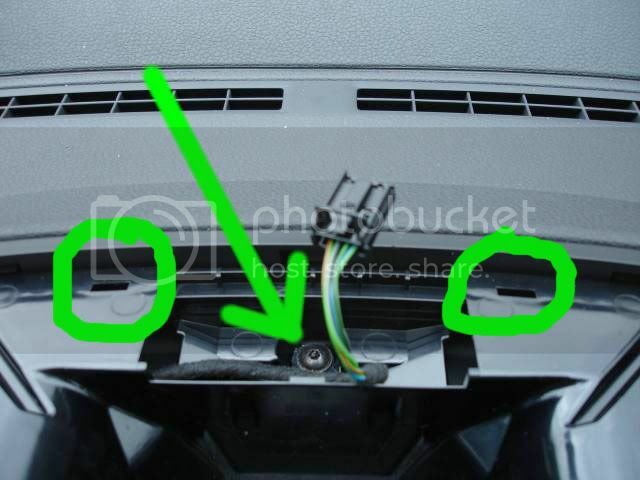 Once I got in there, I tried to suppress my anger, for the VW mechanic had not only broken both of these clips by trying to force the diffuser back in (I remember watching him try to force it at the dealership), but he also forgot to put the torx screw back in where the arrow points. Grrr! Anyways, then I started cutting up some 3M velcro bits. I end up wasting half the container since I don't use the scratchy pads, but I find that the adhesive is stronger on the velcro pads than on the felt pads. So, I put down a piece of padding everywhere the red blotches are. I used the diffuser as a pattern - you can see where the plastic grid crosses, and I put the pads down on those spots. I don't think these spots are where the rattle was coming from, but it definitely made the diffuser area feel a lot more solid when I reassembled it. 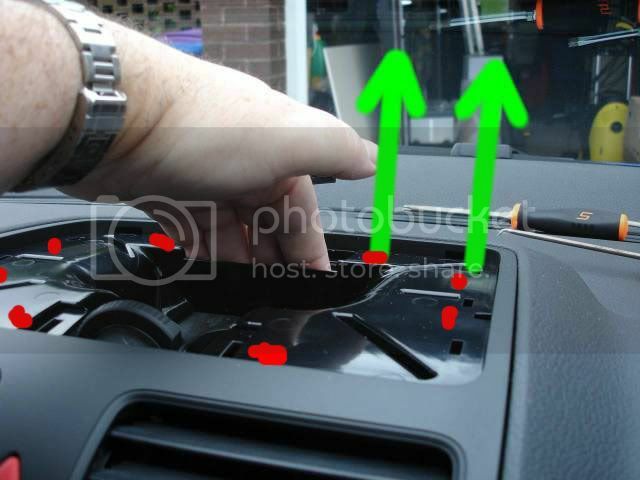 I then pulled up using in the direction of the arrows in the photo above and yanked that plastic bit out. It makes a pretty terrifying sound coming out, but was otherwise painless. After removing the torx screws and prying this area up in the back, I then put in pads underneath all the areas colored in with blue. 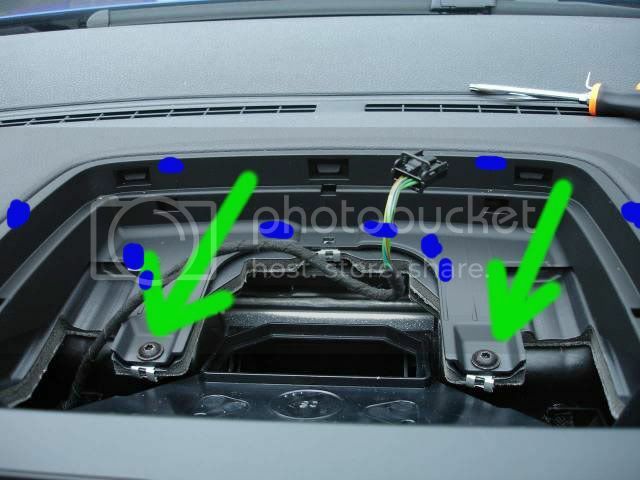 This fixed almost all the flexing in the diffuser area, and is almost certainly where the rattle was. After reversing the procedure, I drove down alleyway after alleyway to the blissful sound of the 2.0T. Mmmm, no more rattles. Discovered a new Firefox plugin the other day that I'm *really* enjoying. It's called AutoPager. Instead of having to click '2', '3', '4', to go to the next page of news sites, forums, blogs, what-have-you, it just loads those pages automatically and appends them to the bottom of your current page as you scroll down. Pretty neat time saver! FoxyProxy - lets you choose proxies based on location, regular expressions, etc. Most of those I just use for work, but Flashblock goes on every computer I have to use, ever. Everytime I use a computer without it, I'm just stunned by how blinky, strobe-y, and loud that everything is. Yuck! soylentmean: Hey babe? Can you help me out with a couple quick math problems? soylentmean: What's ten divided by five? soylentmean: And negative two times negative one? I'm trying to figure out how that works. soylentmean: And how many spaces go after a period? Damn you, Star Tribune! Æbleskiver was one of those rare foods that I make that most people have never heard of, and hence, was a prime wooing food. Now you're saying that any ol' schmoe can just wander down to the Mill City farmer's market on Saturday and grab a handful instead of having to make googly eyes at me? Woe! sokay just returned home from her volunteering with a copy of Punch-Out!! and a Classic Controller. It's like she stalked a leprechaun to the end of his rainbow and found a modernized copy of one of the best NES games ever made at the bottom of his pot of gold! Why does most tupperware (except for the sandwich ones) come with a round base? It accomplishes nothing besides wasting 1 - π * r * r / (d * d) == 21.46% of our refrigerator shelf space. Bah! Which helps low-income folk get a car to drive and to help keep it running. Anybody reading have any familiarity with them, or organizations that might be a bit closer to Minneapolis? Okay, it has been patterned, cut, ground, and foiled. Here's what it looks like thus far. Please keep in mind that is very, very hard to take a good picture of a suncatcher before it's put together and has a decent backlight. Just finished my first stained glass project, thanks to the tutelage of lacewindu - a three dimensional angel made from mirror. It was her first project in school, and she passed it down to me. Why didn't we use stained glass in the first project? Because at an average price of $10/sqft(! ), it's an awfully expensive way to learn. Still a bunch of things to work out, though. For example - how the heck to make the eyes work and not be creepy? And - how can I eliminate some of the angles that would be impossible to do with a manual glass cutter? Update: Technically my sketch is more correct, since Link is left-handed anyways. Well, there ya have it. So, I totally got the GTI. It is absolutely amazing and awesome and I have a totally silly huge grin on my face when I drive it around. I will post more about her in the next few days. What a great way to start your Friday. Oh, and the sun is shining as well! Even my dad thinks I should get it; says I've worked hard to get where I am in life, and that I should totally treat myself once in a while. What says the friend-based interwebs? It's the best axis, after all! For some reason, I always find monitoring global health pandemics to be a perversely enjoyable activity. Of course, unlike most other diseases, influenza is serious business. A similarly lethal outbreak with the current world's population would mean a Monty Pythonesque casualty count of between 175 and 350 million people. Damn... bring out your dead, indeed. Update 1: Apparently the US Dept of Homeland Security is about to declare a public health emergency. That was quick! Update 2: I'm also hearing unconfirmed reports that the dead are rising from the grave and infecting the living with Rage. Panic!! No, there is no journal entry for part one. So stop looking!! Anyways, last week, lacewindu taught me how to pattern, cut, and grind glass. Today, I'll hopefully get to foil and solder it. Then, it's on to my next project - a Rockits logo shaped suncatcher. Very exciting!